Q for self hair dyers. Can I lighten to blonde/fiery red without bleach? My hair is black. I am feeling for a change, and I have colored my hair blonde, but I am open my hair to suggestions. When I dyed my hair I used 30/40 cream peroxide, 3 clairol born blonde packs, and the born blonde developer. I got it blonde, and sometimes I had to do stages, but I was successful. However if I decided to add a color on top, which was usually red, once the color faded, it would have a "dry" look. It wasn't dry though. That's how I ended up with black, because nothing can look more rich than a blue black color. Anywho, I've heard henna can lighten the hair, but not that light I'm sure. As of right now I don't flat iron and I blow dry maybe once a month if at all, however, when my hair gets some length in about a year, I will be flat ironing once or twice a month. Any suggestions?? Also, what's a stripper, and where can I find it? *4a/3c hair, thick, and color treated. To answer the topic question: no. You will have to use bleach or a high lift color (bleach). You can use ColorFix to strip the old color and you can find that at Sally's etc. Thank you mucho for responding you two. Pretty much how I was coloring before is the same process. Bleach with a color on top. 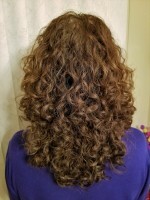 What I am going to be doing different is using a protein filler, and do more to keep my color by some tips I got from youtube.